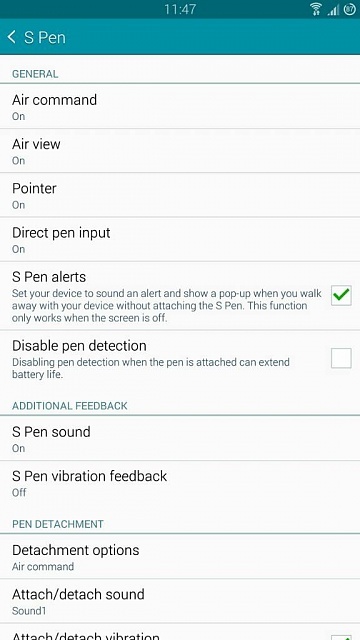 I was wondering why don't s pen gestures work with my phone. I've tried all the instructions here samsung/us/support/howtoguide/N0000005/7899/53306/SGH-T879ZBBTMB but nothing happened. The pen highlights the text instead. Any idea of what I'm doing wrong? Thanks! No doubt you have checked that all the important boxes are checked? Could you be a bit more specific? and perhaps last resort a factory reset. Not sure specifically which gestures you mean, but I have found that some (such as hovering over the bottom, or top, edge of a browser screen to scroll) only work in the stock browser (Internet) not Chrome. Ditto with some of the options that you get after selecting text. Yes they're all checked. I don't think factory reset would work though. The phone is pretty much a virgin, so to speak. I mean when you're in application and want to go home, is there a way to do it using a pen instead of pressing the home button? The official website says you can but the instruction doesn't work for me. Will this phone work on Consumer Cellular?